Aloe vera isn’t just for sunburn; it can help you heal acne, psoriasis, eczema, and other skin conditions and moisturize, tighten, and rejuvenate your skin. Who knew all that was packed inside this one little prickly plant? The aloe vera plant is a type of aloe (aloe barbadensis) that originated in the Middle East and grows worldwide in hot climates. It’s a bit like cactus, with thick, pointed leaves that hold tremendous amounts of water in a clear gel that’s packed with vitamins, minerals, hormones, enzymes, antioxidants, and more. You can keep a potted aloe plant at home to get all the benefits of aloe vera. Simply break off a piece of aloe leaf and use the natural aloe vera gel directly on your skin as an aloe moisturizer. You can also purchase the gel in a bottle. Aloe vera leaf is safe to use all over your body (even for people with sensitive skin) and it can be ingested as a laxative or for help with acid reflux. The benefits of aloe vera leaves are wide and varied. Fresh aloe vera gel is ideal for acne-prone skin and sensitive skin because it helps to heal inflammation and is packed with vitamins and antioxidants. These aren’t the only properties of aloe vera. The benefits of aloe vera gel for your skin are hard to underestimate, you would be hard pressed to find a bottle of skin care product that can match what aloe vera can do for your skin. Reduce acne by killing bacteria. Acne is often caused by bacteria on your skin; aloe vera’s potent antibacterial properties gently deal with the problem without drying out or stripping your skin of its natural moisture. Reduce inflammation. Some acne, as well as other skin issues such as psoriasis, are caused or worsened by inflammation in the body. Aloe vera’s natural anti-inflammatory agents help to soothe and calm the skin so you can avoid heavy chemicals and steroids that can cause more problems later. Hydrate and nourish. Aloe vera is deeply moisturizing and rejuvenating, thanks to the potent amounts of vitamins A, C, and E (all antioxidants) it contains. These help to heal dermatitis, burns (aloe vera has been used by doctors to treat burns for decades), scarring, and dull, lifeless, or dry skin. Aloe vera can be used as a natural laxative and to help with acid reflux and indigestion problems, but I love to use it topically. 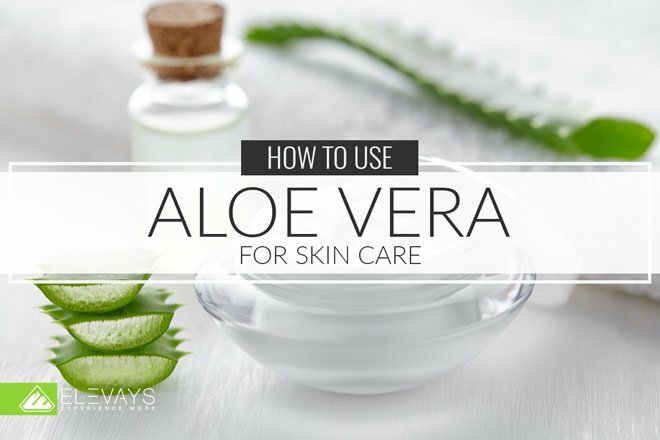 You can use it straight from the plant, or you can purchase aloe vera gel. Can I Mix Aloe Vera Gel With Other Ingredients, Like Essential Oils? Yes! Aloe vera gel works great on its own, but you can also mix it with other ingredients for maximum results. If you’re trying to rejuvenate scars or stretch marks, for example, you can add a drop of frankincense essential oil. This powerful healing oil is known to heals and repair skin, fade age spots and even smooth out fine lines and wrinkles. You can also mix jojoba oil with aloe gel to make a deep facial moisturizer. Add a drop of sandalwood essential oil to deepen the nourishing and hydrating effects. Is Aloe Vera Gel Safe to Use With Oily Skin? Yes. Aloe vera gel has a comedogenic rating of zero, which means it won’t clog your pores. It works extremely well as an acne treatment or even an advanced acne treatment because it won’t make your skin more oily–in fact, your skin will stop making so much oil because it’s finally getting the moisture it needs! Other oils I love to use for oily skin include jojoba oil and almond oil. Can I Drink Aloe Gel? You can drink aloe vera juice (lots of people like to take it in smoothies with ingredients like lemon juice). It will work as a laxative and help with issues like indigestion. When it comes to choosing pure organic aloe vera, it’s important to read the ingredients list. Companies can use imprecise and sometimes misleading words like “natural” and “pure” on the front of the bottle. If aloe vera gel isn’t the first ingredient, you don’t want it! Plus, you want something with as close to 100% aloe vera as possible so you’re not paying for lots of fillers or water. You also want to try to find something with as few extra preservatives as possible. To help you, I’ve rounded up several of the best aloe vera gels for skincare below. If possible, you should also look for pure aloe vera products made from cold-pressed aloe vera, which obtains aloe gel from aloe leaves, without the use of heat, to retain aloe vera polysaccharides which contain most of aloe’s healing properties. These aloe vera packets from S.W. Basics are unique–they’re made from freeze-dried aloe vera leaves, which means they’re 100% aloe vera and shelf-stable. To use, simply combine with water to reconstitute into a gel, and apply like normal. You can purchase a jar or purchase the convenient small packets. The harvested aloe vera is grown in California and is organic. Great for all-over use, this product has tons of aloe vera benefits! It uses xanthan gum as a thickening agent, so it’s a little easier to spread than some thinner, more liquid-like aloe products, making it a great moisturizer for dry skin. The gel for this aloe vera product is grown and harvested in south Texas and is USDA certified organic. It is free of carrageenan and is a great aloe vera for acne prone skin due to its high percentage of aloe vera (99%). Make sure you store it in the fridge–it’s fresh! This pure aloe vera gel is organic and contains no added alcohol, fragrance, or color, and has a liquid-like consistency that works great if you’re mixing it with other ingredients or if you’re trying to freeze it to help sunburned skin. Another great aloe vera skincare choice. This one has a few safe additives to preserve it, as well as xanthan gum to give it a thicker texture. I like to think of aloe vera as a skin superfood. It’s nourishing, hydrating and promotes a radiant complexion. Now that you know more about aloe vera as well as some of the best brands to use, I want to hear from you! Have you ever used aloe vera in your skincare routine? How did it go for you? What is your favorite aloe vera brand? Drop a comment below!